We have started using Lgb Vision Window Cleaning after having various people come and clean our windows . These other companies proved to be unreliable not using the correct methods and were rushing the job. We would not hesitate in recommending Lgb Vision Window Cleaning to anyone. It is today's policy to stay loyal to those you already use but if ever you have doubts or need a change Lgb Vision Window Cleaning are the people. Well done Lgb. We used Lgb at our old address for many years. Their service, helpful attitude and willingness to go the extra mile to help has always meant that they are the only company that we considered at our new address. The fact that they have embraced newer cleaning technology as well as expanding the business shows that they are bright on the inside as well as leaving our house bright on the outside! I have used Lgb Vision for many years as they always do a great job. They leave my windows sparkling clean and also clean the conservatory, clear out the gutters and have removed several wasp nests. I wouldn't use anyone else. 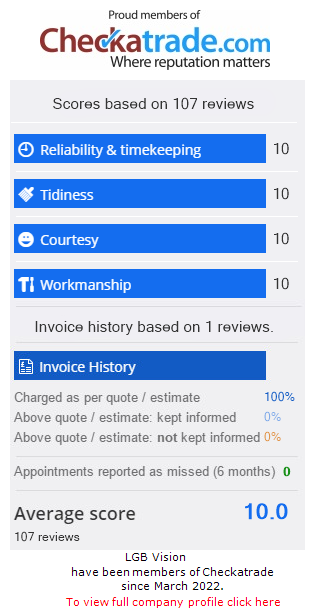 Lgb Vison provided a fantastic service and I was thrilled with the results we had just moved house and the windows both inside and out were filthy! Lgb worked their magic and really went the extra mile to get them sparkling! Brilliant service and very friendly thanks again. Excellent job. Lgb Vision Cleaned my conservatory roof and windows. Very pleased with the finished result. Most importantly, the men from Lgb Vision to do the work were very friendly and helpful. Would highly recommend. Friendly, efficient and flexible. Loved my windows & fascia after treatment. I loved how Damien was busy with my neighbours and said that was it no problem to clean our house to!